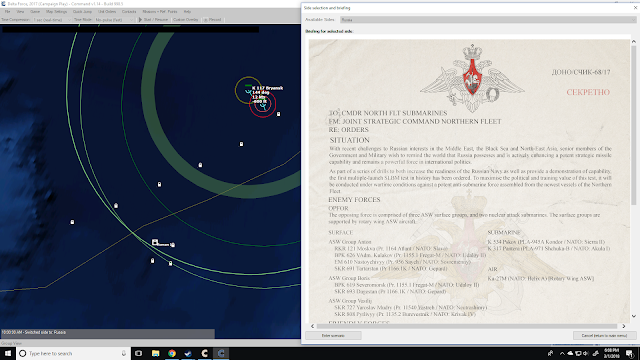 I just played the fist scenario of this standalone (or DLC if you already have the main engine in your hard drive) naval/air war game and I'm (again) floored by the quality of WarfareSim's offerings. The first scenario of "Silent Service" shows a clever use of the engine's capabilities to match real life vectoring of submarines. A great, simple and very effectively designed scenario that balances play-ability and challenge. 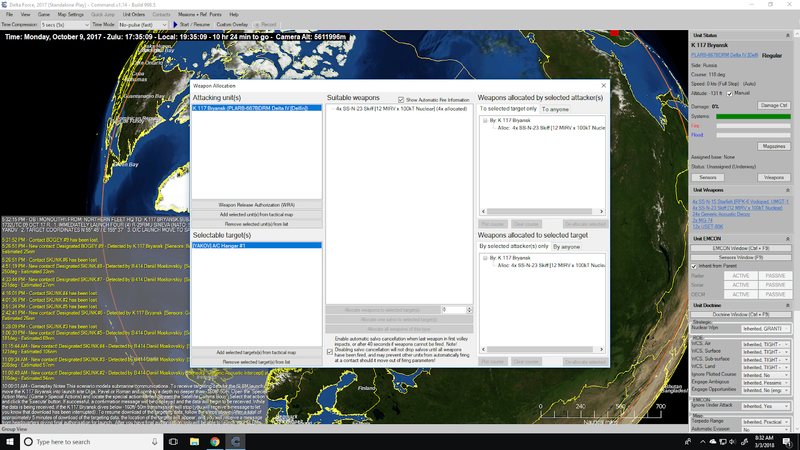 As seen in the screenshot above, this scenario is a nuclear raid exercise. 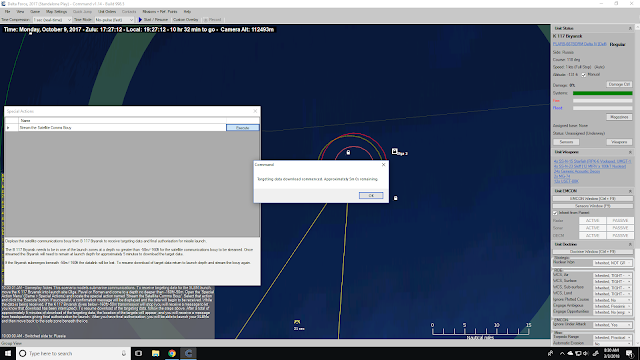 With your two Russian submarines: get into position, receive targeting data, fire your nuclear ordnance and get out. The opposition is "just" 3 ASW groups (with all the trimmings, ASW helicopters included) and two nuclear submarines. The time allotment is just 18 hours and no, you can't squander that precious time just hiding your two submarines under the cloak of a creep throttle position. You may have two submarines under your command, but Russians are not very fond of reconnaissance when submarines operate independently without the cooperation of other platforms. So plot your route to the firing position and be clever about your speed and depth. While playing this scenario, I was reminded how in ASW, simple operational concepts open up a cornucopia of options for execution. So vast is that diversity that I'm going some more time with this scenario to explore the most interesting courses of action. You nukes are served, sir. 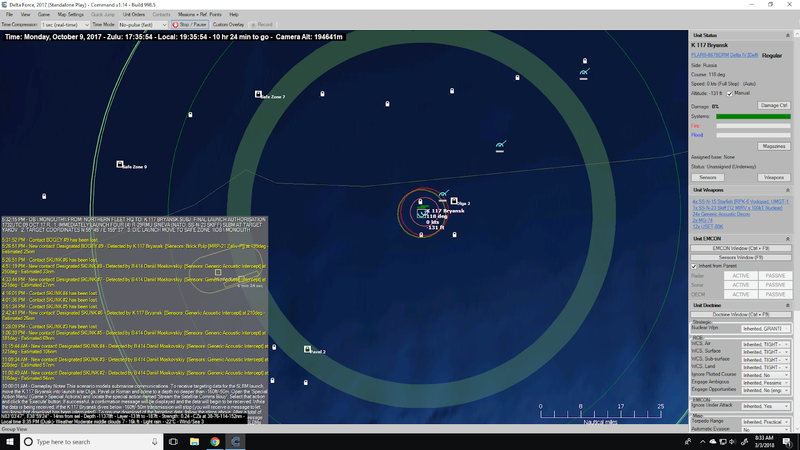 SS-N-23s fly away towards very distant targets. The Daniil Moskovskiy has paid a high price for my commanding shortcomings. It's always good when a new game opens up with 400 kilotons of fun. Nice mission, one thing that I don't get is what happened to the Daniil Moskovskiy (a submarine as I searched), friend of foe, and how it was lost as it was an exercise. I started a couple of weeks ago with Cold Waters and I will buy this module to continue riding the wave of the Silent Service. I assume that the sub was not really sunk. 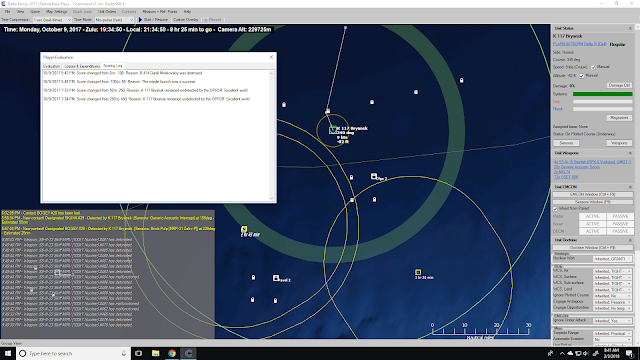 It was just detected by the sensors of the ASW forces that played the opponents in the exercise, and then they launched a simulated attack that was judged to be a kill.